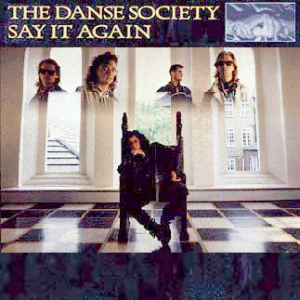 The Danse Society are a post-punk group from Barnsley, England, who were active from 1981 to 1987, and recently reformed in 2011. They achieved moderate fame during their short career. Their line-up included Steve Rawlings (voice), Paul Nash (guitar), Lyndon Scarfe (keyboards), Tim Wright (bass) and Paul Gilmartin (drums). Lyndon Scarfe was replaced by David Whitaker (formerly of Music for Pleasure) after the Heaven is Waiting album. In 1980, they recorded and released their first single, “Clock”, on their own newly formed record label, Society Records. On their 1982 album, Seduction, they recorded a cover of In Heaven (Everything is Fine), a song featuring prominently in David Lynch’s film Eraserhead. Their most well known album, Heaven is Waiting, was released in December, 1983 by Arista. The album contained the singles “Wake Up” and “Heaven is Waiting” and a cover of The Rolling Stones song, “2000 Light Years From Home”, released in 1984 as a 12″ single and as a limited edition double single. They released two further singles under Arista “Say it Again’ and “Hold On”. “Say It Again” is probably most famous for being produced by Stock/Aitken/Waterman and remixed by Phil Harding.